Ever since I cut my hair into a bob/lob, I've had to change up the way I style my hair quite a lot. I'm going to take you through the last 7ish months of my hair, and what I finally found to work for me now. When I first got my hair cut back in early March, I LOVED it, but quickly found that the cut was NOT for curly hair. I tried going about styling it the way I usually did when it was longer, but it stuck up in weird places and just did not work. So, for a few months I stuck to heat styling it with a curler or straightener. This was actually a nice change, but after a while I got bored of having to do that every time I washed it, and I missed having my curly hair. I looked for specialized curly hair salons in Dubai, but did not find any (if anyone has suggestions, please let me know! ), so I waited for the Summer when I knew I was going to be in London and could get it fixed there. After a bit of research, I decided to try out Unruly Curls in West London, as it was not too far from where I was staying. The place wasn't the easiest to find, but it was definitely worth it. I got my hair cut by Emma, who was lovely and understood exactly what I wanted to change, and what needed fixing in my hair. After she fixed the cut and talked me through styling it, off I went with my new curly bob. Now, I'm not going to lie, at first I was shocked/scared at how CURLY it was. That may seem silly, but it sprang up so much more than I was used to, and although I didn't exactly hate it, I didn't love it either and felt uneasy on the way home. As Emma had reassured me though, it calmed down within an hour or so, and the more I got used to it, the more I loved it. Honestly, I am not too picky about this step. I like to use products that are specifically formulated for curly hair, but other than that I'm fine so I change up the brand quite a lot. I don't find that sulphate free ones particularly effect anything, so I usually peruse Boots and see what new things I can find. I'm currently trying out the Bumble and Bumble duo above, and I really love them. They smell fantastic, leave my hair soft, and don't cause any additional frizz. I apply the shampoo focusing on my scalp, rinse it off, then apply the conditioner all over my hair. I used to only apply conditioner mid to ends, but since it's quite short I found that quite useless, and this conditioner isn't heavy at all so it doesn't weigh down my fine hair. This is the step that I find can make or break my curls. I find the best time to apply this product is in the shower the second you are done. I will usually comb out my hair, give it one more rinse, then flip my head over and run the product through all of my hair. I used to get out of the shower, wrap my hair in a towel until it's damp, then apply the product - but I find that way leaves me hair a lot more frizzy and not as nicely curled. Applying it when the hair is dripping wet is definitely the way to go. Since I picked up the B&B shampoo and conditioner, I thought it right to get the curl defining cream in one go and see how they all work together. After a few weeks of usage I can say that I like it and will use it all up, however it's nothing special. It gives me pretty good definition and tames the frizz, however after a day or so the curls start to flatten or frizz up. I also picked up the TIGI Curls Rock Amplifier (Currently on sale for £11.55 on Feelunique) as that's what was used on my in the salon, and I absolutely love it. It smells amazing, and defines my curls perfectly without making them crispy at all. It also leaves my hair nice and curly for a good 2-3 days before it needs a wash again. 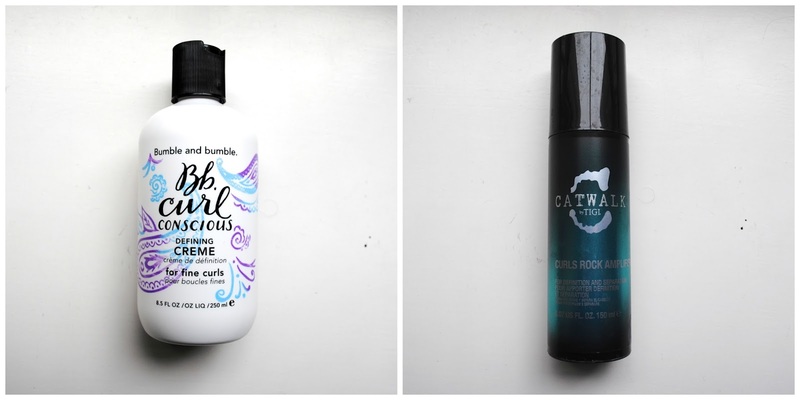 This has definitely become one of my favorite curly hair styling products, easy. I apply both of these in the way mentioned above. Before getting my hair cut, I barely ever diffused. Holding a blow dryer up to my head until the dripping wet curls dried seemed like it took WAY too long and I had no patience for it. However, since I got it cut I found that it looks best when I do it this way. I let it air dry sometimes too, but when I do I don't get as much volume. I usually set it to high heat and medium strength, flip my head over and do it in three sections, then flip it back and do half/half. This takes about 7-10 minutes if I want my hair to be completely dry, so I do it while watching a video of some sort on youtube. 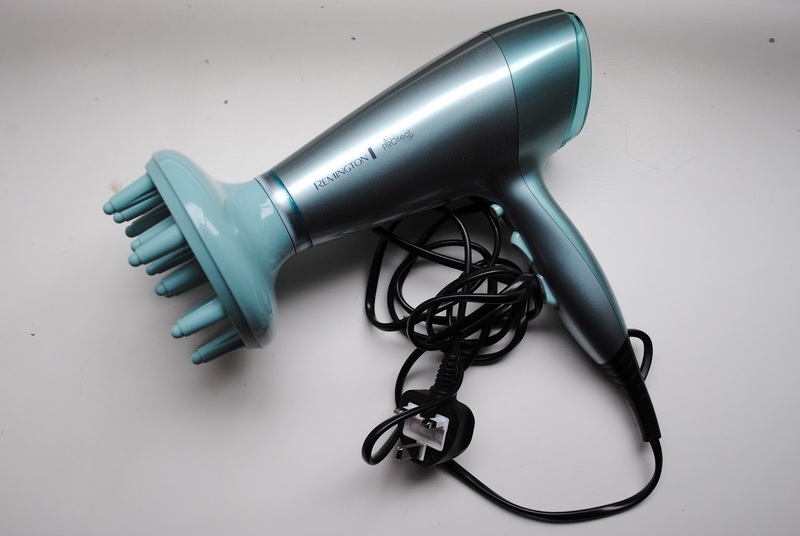 I picked up this hairdryer from boots because it was a great price, included a diffuser, and had three heat and two strength settings. So there you go, that is my very long hair story and styling routine. Let me know if you have any recommendations, and I hope that this was somewhat helpful for those struggling with their curly hair.